Energy business and utility organizations depend on the time- and cost-savings power of the leading ECM—OnBase. This energy compliance management software is designed to help streamline your operations, enhance your efficiency, boost your profit margins, and ensure conformity. Energy document management: Onbase offers a single repository for all your documents and records stored in one place. We provide energy workflow automation that ensures seamless storage of documents from all of your current systems, granting easy access through your favorite ERP. Energy workflow automation: Streamline and increase the efficiency of your finance and accounting processes using the top energy management software – OnBase. Its solutions promote faster inter-departmental processing, more quality decision-making, and allows all departments to share critical information and resources amongst themselves easily. Overhaul your contract management process by streamlining each of its elements to ensure your operations are more efficient, secure, and saving you time and money—all possible with the help of energy management software. Get the most out of your human capital management system by seamlessly integrating it with OnBase. This allows employees to easily and instantly access prospective and current employee documents and information directly from the application. Ready to transform your back-office operations for your energy business? OnBase is the world’s leading point-and-click configurable ECM solution. Drives the automation of processes, manages your crucial manufacturing data and information securely and works hand in hand with your other applications to deliver data when and wherever its required. With over 13,000 companies in more than 70 countries, OnBase is the trusted platform of choice to securely manage the world’s content. The OnBase platform allows you to rapidly deploy customized solutions typically in one-tenth of the time of competing ECM solution providers—all without writing a single line of code. Requordit has over 20 years’ experience delivering OnBase solutions for organizations of all types and sizes, from a hundred employees to hundreds of thousands of employees. Energy compliance management: With the rich levels of security, version control and audit trails OnBase provides, it’s easier than ever to support compliance initiatives and meet auditors’ needs. 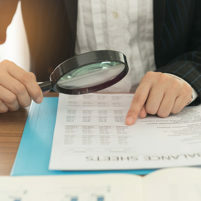 OnBase provides a fully auditable and reportable usage trail of all actions taken on a document – including who viewed it and how often – managers and auditors have a direct look into each record’s history, simplifying compliance. · By integrating with Oracle Utilities Work and Asset Management, users can access information in OnBase directly from their familiar line-of-business applications. This helps the company streamline processes like purchasing, AP and inventory and maintenance control. Discover why Requordit is the ideal digital transformation partner. "Requordit's team is the best"
Our internal support desk works with many vendors and Requordit's team is the best by far, thank you for being a great partner. Requordit is the best IT vendor we work with. This is the biggest win with OnBase. We turned what was a four-hour job every day, processing 15-300 invoices into an hour or less.